creamer and continue to whip until stiff peak, place into a piping bag. This post is linked to the event Little Thumbs Up (September 2015 Event: MIlo), organized by Zoe (Bake For Happy Kids) and Mui Mui (My Little Favourite DIY). Your boy did a great job making these milo puddings! 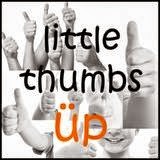 I give him thumbs up and toes up too... LOL! Jozelyn, I see that you have a very cute assistant to help you make the Milo Serradura! I love to see the handsome young assistant made the Milo Serradura. And he's so enjoying this dessert!